August writers and intimations of mortality mark this year’s fine collection in this annual series. 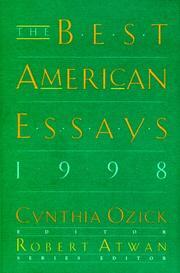 In her introduction, novelist and master essayist Ozick (Fame and Folly, 1996, The Puttermesser Papers; 1997; etc.) writes with characteristic firmness of the “living voice” of the essay. Maybe it’s due to the coming of the end of the century, to the ages of these writers, or to Ms. Ozick’s own personal outlook, but the voices bending our ears this year are often settled yet still in awe of humanity. Ian Frazier finds Queens, New York, a kaleidoscope of hopes; Brian Doyle is moved by the force of the Catholic Church; Sven Birkerts explores the “transformative” power of the act of reading, and more. Nearly without exception, the writing in the essays is so good that if you love the genre, you almost have to sit before the words and be happy. The rub? As in some previous years, it’s the presence of many more Sure-to-Please Masters than Newer Writers Deserving Attention, as well as the high representation of Well-known magazines in the volume. Though who can truly quibble with a lineup that includes Coetzee, Kincaid, and McPhee, and that culls from the New Yorker and other estimable venues? It’s just that while essay fans read such collections to revisit old friends, most of us also hope to find stunning work from little-known writers and magazines. For instance, it’s pleasing to be introduced to Anwar F. Accawi, who details with finality the wreck of his Lebanese village by modernity in “The Telephone,” and to get a smattering from less-mined journals like Alaska Quarterly Review. Someday, please, more of the new and less of the old. For an angrier, more confessional, or more reportorial mix, we—ve been put on hold.